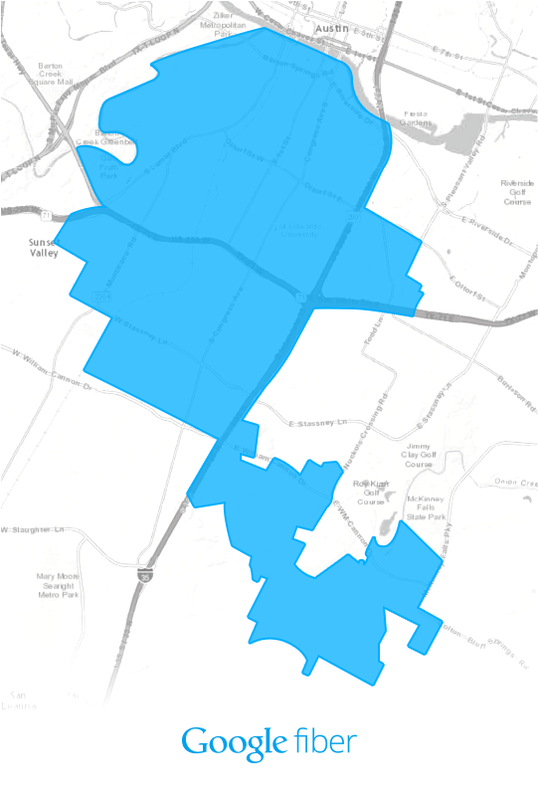 It has been announced that Google Fiber service will finally launch in Austin - possibly as early as December 2014. Based on permit applications, various news websites have indicated that South Austin will get the Google Fiber service first. Areas just south of downtown's Lady Bird Lake like Barton Hills, Zilker, and Travis Heights may be some of first lucky residents to get the super-fast 1 Gigabit internet and cable television service. Google has been working with muti-family developments like apartments and condos to get wiring installed in advance of the roll out. By wiring entire complexes at the same time, they can get maximum service penetration, and allow muti-family complexes to "future proof" their units - making them more desirable to live in. Currently, Google has been waiving the construction fees for multi-family developments - thus eliminating "out of pocket" installation costs. Once a complex grants Google the right to access their property, Google will devise a wiring plan, and once approved by the community, Google will wire the entire complex. The new fiber optic service is run from utility poles via overhead or underground cables to a point near electrical utility meters - and from there would likely be run via external covered conduits and paintable trim molding to individual units. Once inside the unit, they will put a small utility jack near the electrical outlet best suited for television watching. My 40 unit condo complex is supposed to get wired in early December, and I'm really excited for Google Fiber to arrive! Based on looking at the services offered in Kansas City and Provo, UT -- it appears that they will likely offer incredibly competitive rates and services. The clearly defined and straightforward rate plans would certainly be a welcome change from the constantly changing/expiring/increasing rate plans offered by competitor Time Warner Cable -- as it seems that any plan with TWC dramatically increases in cost at the expiration of the yearly promo. Here's the link for Property Managers wishing to get their multi-family units wired for Google Fiber. Learn more about Google Fiber in Austin.